The membrane and the support system underneath it. Adapa, a Danish manufacturer of reconfigurable moulds that is relatively new to the region, has forged strong connections in the construction market and has already started supplying to prominent projects, such as the new terminal at the Kuwait International Airport. Its trademarked Adaptive Moulds is a state-of-the-art technology that leverages lean manufacturing principles to produce complex curved panels on flexible moulds. “We are pioneers within the field of flexible robotic moulds and there is no rivalling technology or product,” Christian Raun, the company’s founder and COO, tells Gulf Construction. One of Adapa’s smaller mould sizes. The Adaptive Mould consists of stepper motors, a silicone membrane, a 3D laser projector, a control panel and even comes with a Rhino 3D software plugin. The durability of the moulds depends on their usage, with a well-maintained mould expected to last up to a lifetime. Raun says the company’s mould can be used with a wide array of materials, including but not limited to, concrete, composites, glass, thermoplastics and gypsum. “The possible applications of the panels formed on Adapa’s mould are countless and these can be used to build everything from false ceilings to the hulls of boats,” he emphasises. Adapa’s largest deal in the region to date is the Kuwait International Airport project, where it has supplied 85 reconfigurable moulds to the principal contractor, Limak Construction, for the construction of the new terminal. The moulds are being used to create all the internal roof and wall surfaces of the new airport terminal. 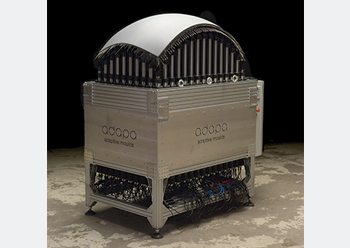 “Since the Adaptive Mould is reconfigurable/adaptive, using this mould will enable production to be streamlined and automated with minimal difficulties in managing over 220,000 sq m and 40,000 unique panels,” says Raun, adding the alternative is CNC machining, which would have cost the contractor at least five times more, on the current project alone. The company is also working with the likes of Arabtec, Reckli and Advanced Fibreglass Industries, on some turnkey projects. About the GCC market, Raun says there’s tremendous opportunity across the region which is one of the most progressive and forward-thinking when it comes to architectural innovation, and that is what makes this an enticing market for Adapa. He sees big opportunities in the UAE, Saudi Arabia and Kuwait markets. Adapa currently only has a sales office in Dubai. 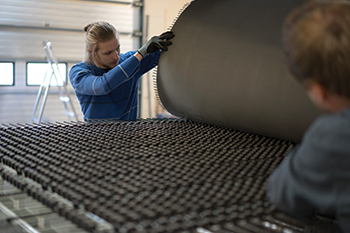 Its moulds – most of which are made to order – are manufactured in Denmark and shipped to the client’s location, where they are assembled by Adapa engineers. In addition to mould assembly and staff training, Adapa also provides consultation services on how to make the most of its mould. However, Raun says the company has “a strategic acquisition in the works, which will help it bolster its operational capabilities in the region. “For now, we want to plant our feet firmly on the ground. And by that, I mean we want to have an adequate presence here to enable smoother operations. Our primary challenge today is the shipping time between Denmark and the client location. Having a similar facility here will help us cut down transit time drastically and increase our ability to recruit top talent to assist in our growth,” he says. Adapa is open to new partnerships and opportunities and calls upon industry peers to come together to achieve great things. The company wants to grow and nurture meaningful relationships in the region, so as to enable it to position its mould as the norm for any large-scale developments. It also plans to introduce more products and services to diversify its offerings portfolio. This will not only help it attract new customers, but will also assist with customer retention. As a company, Raun says it is committed to promoting free-form architecture in the Middle East, and across other parts of the world. “The Adaptive Mould is just one step in the direction of that larger goal. We have other products that are in the R&D (research and development) stage, which we plan on rolling-out over the next couple of years,” he adds. In fact, Raun says Adapa is in talks with various research organisations in Singapore and Germany to explore the possibility of developing a combined solution using Adaptive Moulds and 3D printing for the construction industry.